“Neither of us really had a good childhood,” says Violeta. She grew up in a dysfunctional family, while Mihail had a hard time growing up due to eyesight problems caused by the effects of the Chernobyl disaster. When they found each other, they were confident they could overcome any obstacles. Physically exhausted and emotionally overwhelmed, Violeta decided to seek help. In February 2016, she learned of the SOS family strengthening program in Kiev. There she met Olena Kalinichenko, a social worker who recognized that the young mother was on the verge of a breakdown. “Psychological counseling for Violeta was the most important step at that point,” Olena explains. 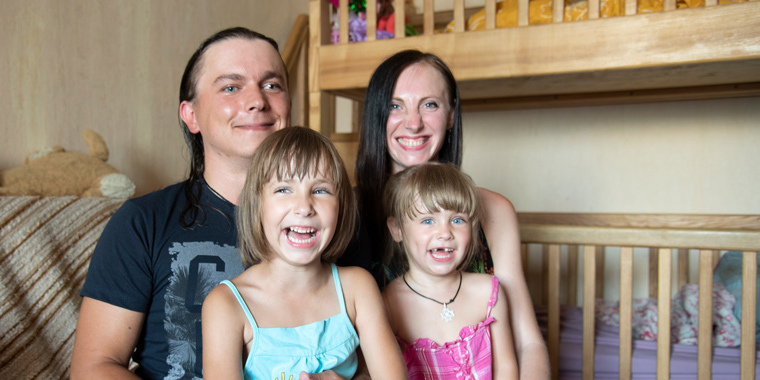 To help the family meet the most basic material needs, SOS Children’s Villages Ukraine also supplied diapers for the girls, hygiene packs and food for the entire family, and school stationary for Artyom.